For thousands of years, red wine has been the drink of choice for Egyptian royals and “basic” girls alike. However, there is more to wine than its ability to “class up” a dinner party. Romans and Greeks recognized the medical benefits of grapes and grape products for treating health issues from skin and eye diseases to nausea and cancer. Today, much to the world’s delight, scientists are uncovering the properties that make red wine beneficial for our health – even suggesting that one to two glasses a day may keep the doctor at bay! Today, it’s common to hear the health benefits of red wine as one aspect of the Mediterranean Diet. The Mediterranean Diet, officially characterized in the 1960’s, includes colorful fruits and vegetables, extra virgin olive oil, fiber in whole grains, nuts, oily fish, and red wine (in moderation, of course). The nutritionally unique cultures bordering the Mediterranean Sea enable scientists to epidemiologically study the effects of this diet on various aspects of human health. Such health benefits include reduced risk of cardiovascular disease (CVD), some cancers, diabetes, metabolic syndrome, Parkinson’s and Alzheimer’s Diseases, and increased lifespan. If you look in the top right-hand corner of the Mediterranean Diet Pyramid, you can confirm that I’m telling the truth; red wine is in fact included in this diet. What compound in red wine offers health benefits? The individual benefits of red wine in moderation are also numerous. Red wine contains anti-cancer properties, prevents CVD, enhances cells’ stress resistance, and may potentially increase your lifespan. One of the most notable beneficial compounds in red wine is the stilbene polyphenol, resveratrol. Resveratrol is a type of antioxidant compound found in plants that is synthesized in response to oxidative, pathogenic, or environmental stress. When we ingest polyphenols, they act as free-radical scavengers found that weaken the buildup of arterial plaque, chronic inflammation, and the initiation of cancer. The amount of resveratrol in a bottle of red wine is directly related to the grape’s sun exposure, which contributes to the wine’s color as well. Think about that fact the next time you swirl your glass of red wine! How does resveratrol affect your health? Any search engine inquiry into the relationship between resveratrol and cancer will yield an extensive list of papers demonstrating resveratrol’s beneficial effect against the development of certain cancers. In addition to red wine’s protective effect against CVD, resveratrol inhibits cancer formation, enzymes involved in the inflammatory pathway, and angiogenesis — the production of new blood vessels that nutritionally supply growing tumors. Adding to the number of molecular targets resveratrol acts upon, this polyphenol affects cell cycle and cell death, two cellular processes involved in cancer development. Resveratrol also demonstrates some ameliorating and protective benefits against neurodegenerative diseases similar to its anti-cancer properties. Don’t be so generous with that bottle of merlot, though; excessive wine consumption per day over an extended period of time can actually increase your risk for CVD. Moderation is key when comparing the beneficial and adverse effects of wine consumption. So the next time you and your friends enjoy a glass or two of red wine, you can not only appreciate the company, but also the preventative action you’re taking against developing cancer, CVD, and neurodegenerative diseases. Salute! Leah Caplan is an undergraduate studying biology with a concentration in neuroscience at the University of Georgia. When she is not studying, Leah can be found cooking and baking to the solid gold oldies, or out for a run burning off the calories from the cookies she just made. 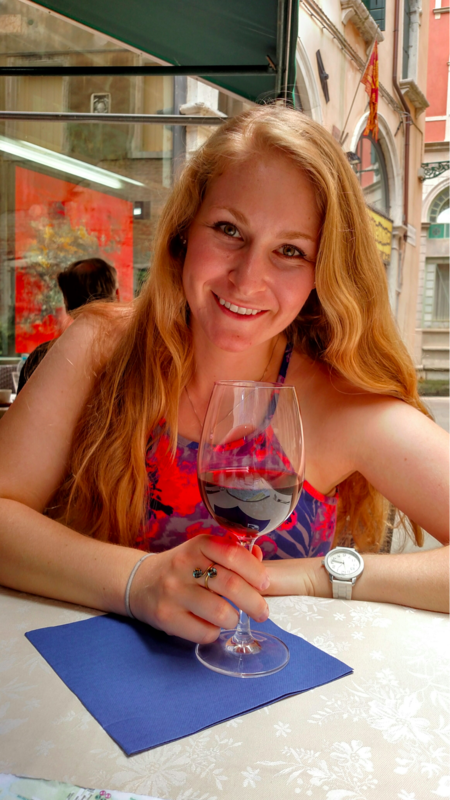 Leah enthusiastically adopted the Mediterranean Diet during her time in Italy. More from Leah Caplan.